Have a Nice Life recently released Deathconsciousness, an ambitious double disk collection of songs that also included a booklet discussing the possible existence of a heretical apocalyptic type Christian sect from the Middle Ages that helped to inform their music and lyrics. The sophistication and ambition necessary to compose and write such a large work goes beyond what most bands or groups are willing to or can release on their own. Having been a laborious endeavor over roughly six years, the band released Deathconsciousness only just this January through their own, Enemies List Home Recordings label. After acquiring this release of this impressive collection of music, I had to pick the brains of the two people responsible for this band and its strangely alluring melodies, rhythms, and sounds. Scene Point Blank: How did the band start? Dan: Have a Nice Life started by email. Tim and I had met when our previous bands had played many of the same shows. I left the states to study abroad but kept in touch with Tim; we found out we had both been doing some acoustic recordings, traded tapes back and forth, and quickly discovered we were more or less the same person, and decided to start a band when I got back, almost a year later. Tim: Our earliest endeavors revolved around making college coffee house sorts uncomfortable. There was a basement show phase as well. However, once we got into home recording, we became shut-ins. Scene Point Blank: Did you start with the Deathconsciousness concept right from the outset? Dan: Deathconsciousness as a concept and unifying theme came much later. The songs are spread very, very far apart, chronologically, although most are from the last two years or so. Tim: Though our earliest demos, come to think of it, revolved around death, dying and the dead as well, albeit in a more absurdist context. Deathconsciousness as a concept, I guess, is a logical development of this fixation. Scene Point Blank: How did you come upon the Deathconsciousness concept? Dan: Deathconsciousness is very closely tied to what was going on in my life at the time of its recording. It emerged naturally from my writing. It's the opposite of the predominant cultural attitude towards death in the West, namely that we should pretend it doesn't exist. It does exist, and for a long time it was all I could talk or think about. That naturally influenced the music, lyrics, even the packaging. Scene Point Blank: Have you ever read Neil Gaiman (fiction writer of Stardust, American Gods, Anansi Boys, etc. that started out writing comic books)? In one of his more famous comic stories he puts forth the idea that death is something that humans wish for, look forward to, and ultimately choose because they do not have the necessarily have the stomach to live for eternity. Do you think this is a contrasting idea or similar to the ideas that you discuss in text of Deathconsciousness? Tim: On a physical level, he has a point, although we gear quite a bit of our technology towards trying to prolong our lives. Spiritually, though, the belief in/hope for a hereafter, whether it is reincarnation or paradise, is quite old. Humans have a lot of anxiety over the prospect of ceasing to be. Having the ability to think "I" isn't necessarily balanced with "Not I." Dan: Actually, I think the ability to think "I" precludes truly understanding the "Not I"...it seems impossible to conceive of a state in which we do not exist to conceive it. We can get close, but it's more emotional than intellectual. That's what the music is for. Scene Point Blank: Do you think that the predominant western attitudes towards death are psychologically unhealthy? Tim: People get by. I don't know, this could easily turn into a Kierkegaard-footnoted essay on the blurry line between faith and madness. Scene Point Blank: The precepts of the Antiocheans were pretty much an opposite reaction against this train of thought by embracing death. Is that what drew you to the sect and their mystery in the first place? Do you believe that the application of their philosophies would be met with just as much resistance today? Dan: Antiocheanism is obscure for a reason. We were, and are, attracted to anything so violently at odds with it's own zeitgeist, because we feel that way as well. Scene Point Blank: Did the writing of the music take long or was it a constant progress over the five or six years that the band worked on the record? Tim: It was a slow burning process. Some of the songs were re-recorded multiple times; some of them abandoned altogether, several still yet in working production for a different release, as they didn't seem congruous with this particular project. In addition, we only work a couple of times a month due to distance and work constraints. Scene Point Blank: How about the lyrics? Dan: The lyrics were written simultaneously with the songs, though I tend to work in scraps...I'm constantly writing, then culling pieces that I think fit the music to build entire songs around. At the time I had a job where I would have to be in to work at 4:30 in the morning, alone in a giant building, at a desk in front of a giant window. I wrote reams and reams during that time. Scene Point Blank: Are the CD's fairly linear? Are the CD's chronologically representative of the band's work? Tim: The songs on each CD were sequenced very particularly and do not necessarily reflect the order in which they were completed. A listener with a good ear could probably order them as such, though. Scene Point Blank: Was it a conscious decision to release the album yourself? If so, why? Dan: We always knew we would release the record ourselves. Outside of those closest to us, hardly anyone was even aware that we were writing music. It's just something we do, and have done consistently since we met. There is never a point when we aren't writing or recording music...releasing the record was, and always has been, secondary to the act of writing it in the first place. To be honest, I'm surprised anyone likes it but us. Scene Point Blank: If given the opportunity to re-record and re-release this project with backing from a label, would you do it? Why or why not? Dan: No. We could barely bring ourselves to stop working on it as it is. We're already working on new material and I have no interest whatsoever in covering the same ground twice. Tim: I've been told that works of scholarship are never truly completed, merely abandoned. We've adopted that attitude towards our music. Scene Point Blank: Ever think about a possible vinyl release of the music? With the larger format, the art and design possibilities could be even more rewarding; it would also satisfy vinyl junkies like myself. Tim: If we had total control over extremely affordable means of production, perhaps. But right now that doesn't seem like a possibility. Dan: We are completely self-financed, and use our label, Enemies List Home Recordings, as a means of producing things we do or enjoy. I'd like to do vinyl, but it seems out of reach at this stage. It's definitely a consideration, however. If people are interested, let us know. The more people that ask, the more likely we are to do it. Scene Point Blank: Have you gotten much feedback since the album's release? How do people seem to be taking it? Dan: We've gotten some very favorable reviews, and a lot of very kind emails. The response was a total shock. I'm happy that people enjoy the record, and get a great deal of satisfaction from it, but I never really thought it would leave the bedroom. I'm glad people relate. Scene Point Blank: With the release, what comes next? Touring? Writing for another record? Dan: We are always writing. We're working on developing a live show, something that can exist as a separate entity from the recording, but unless we can get the intensity right I'm not interested. Scene Point Blank: What avenues are you looking to play live? Would you play to tape? Or would you look for a full band to cover all of the instrumentation? What other challenges do you foresee in playing the songs live? Tim: Dan's been making noise about the system Blonde Redhead uses. Dan: I like that they record first, and figure out how to play second. I am very interested in turning Have a Nice Life into a live experience, but would not do it if I felt we couldn't capture the essence of the music. If we can't make it intense...if it's just us fiddling with knobs and so on...then it isn't worth it. 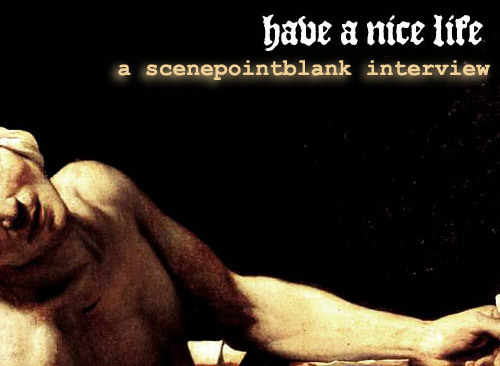 Scene Point Blank: Do you have a background in Anthropological research or Religious studies? If not, what made you interested in doing or participating in the research? Dan: Tim and I are both currently in the process of getting our masters degrees in History. Tim: Overall, unhealthy amounts of reading. Scene Point Blank: Besides unhealthy amounts of reading, what else informs and influences the band? Tim: Broadly speaking, our sense of place is a huge factor. 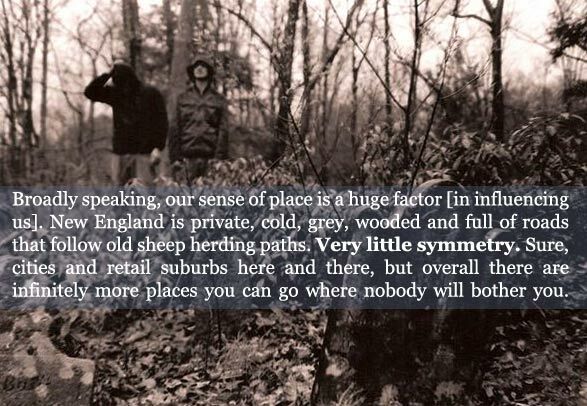 New England is private, cold, grey, wooded and full of roads that follow old sheep herding paths. Very little symmetry. Sure, cities and retail suburbs here and there, but overall there are infinitely more places you can go where nobody will bother you. Film is a big one for us, too. Older arthouse standbys like Kurosawa and Bergman. Scene Point Blank: How did you and your associates go about the research for the booklet? What were the main sources? Where did you all find the material? Dan: Discussing Antiocheanism was, for us, a way of discussing the music. The two mirror each other exactly; every word of one informs the sounds of the other. Scene Point Blank: Would you do a second edition of the book if you all found more information? Dan: I don't think it's necessary. Scene Point Blank: How did you come about collaborating with the professor? Why was his name redacted? Dan: We can't really talk about it. The book was ghostwritten, I can say that much. It isn't interesting. Scene Point Blank: If you were offered a book deal based off of the work in the book so far, would you take it? Dan: There's a reason we put the record out ourselves: we were convinced that no one would want to hear it. The same goes for the book. I hope people read it, but somehow I doubt they will. Scene Point Blank: I read the book three times and found the concepts and anecdotes very interesting. If anyone were interested in learning more, where would be a good place to start? Finding any information on my own has been met mostly with disappointment. Dan: It's extremely hard to find anything on the subject. The reasons why are explained in the piece, looking for published sources is bound to result in disappointment. The author of the text has distanced himself from the project, and as such we are unable to put out anything new on Antiocheanism, as originally hoped. It's amazing we were able to publish what we did. Scene Point Blank: As far as other people not being interested in the record, it sounds like you may have miscalculated. For your new material, will it be along the same lines? Will it use what you have previously written as a starting point? Or are you looking at taking a completely different direction? Tim: We write music we like. So if there are people out there that like music we like, that's cool. I guess there will be some continuity. Dan: We really only found our own sound at the very end of the Deathconsciousness recordings. The way we write naturally lends itself to very long periods of writing, over which each song is tweaked, manipulated, added to, etc. It is a completely organic process, and as such there's no telling, really, what the end product will be... I, however, am very interested in exploring the area we began to cover in our more recently recorded songs ("Bloodhail", "I Don't Love", etc). We'll see. Scene Point Blank: What do you hope people take away from the whole Deathconsciousness release? Dan: We would've written the exact same record if we were the last two people on Earth. It was recorded assuming that no one would ever hear it. If anyone does and they enjoy it, that's great. I hope that happens. But that's about as far as it goes. Scene Point Blank: If you have anything else to add, feel free to do so. Dan: If anyone is interested in picking up a copy of the record, they can find instructions at our website. And thanks. Posted Oct. 10, 2007, 1:17 a.m. The Ocean have debuted two tracks from their upcoming full-length, Precambrian, online here. The album is due out November 27th via Metal Blade Records.